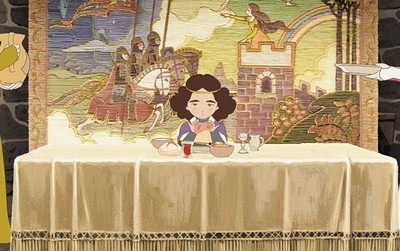 The film Princess Arete is the tale of a little girl growing up in a castle, refusing to resign herself to being married to a hunky Prince Charming. 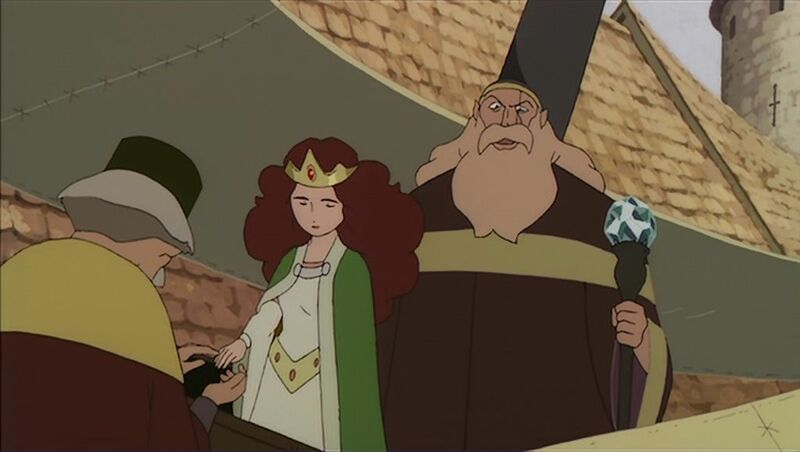 Then a sorcerer, frightened by a prophecy about the girl, effectively buys her from her father and imprisons her in his remote castle… but Arete has friends and her wits, and sets about winning her freedom. Most anime fans, looking over Arete’s credits, will clock two names. One is the director, Sunao Katabuchi, who has made anime ranging from the lurid Black Lagoon to the lyrical Mai Mai Miracle. He’s now enjoying acclaim for In This Corner of the World, an anime film about a Japanese woman’s life in World War II. You may also recognise Arete’s animation team, Studio 4°C, which made Tekkonkinkreet, the Berserk film trilogy and much of Animatrix. But anime fans may not recognise the source story, a British children’s book called The Clever Princess. Today, the phrase “cultural appropriation” has become a sledgehammer to denounce moral crimes, and damn the messiness, the to-ing and fro-ing exchanges between cultures through history. Few anime fans, though, have a problem with anime’s appropriations of British children’s literature. The most famous of these are Ghibli’s adaptations: Howl’s Moving Castle, When Marnie Was There and The Borrowers. Studio 4°C’s version of The Clever Princess is in the same mould. The original book was published in 1983 by Sheba Feminist Publishers, which described itself as “an independent publishing co-operative which produces books by and about women.” Several of its titles were for younger readers, including Girls Are Powerful, a collection of writings from the feminist magazines Spare Rib and Shocking Pink. The sixty-page book comprised eight chapters which could each be a bedtime read-aloud for parents. It’s a feminist fairy tale, of course, where Princess Arete is a fully active protagonist, unlike the archetypal Snow White or Cinderella. 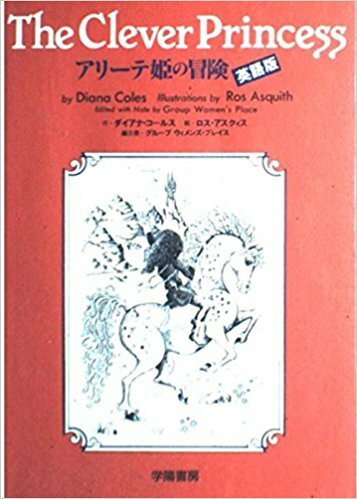 The English edition was illustrated by Ros Asquith, now a prolific author and cartoonist. Asquith’s pictures in Clever Princess have humour and charm, as well as extra text for kids to read. But they also have a sense of mystery and wonder, and are never too cute; they’re far from Quentin Blake. When he stepped up to direct the Arete film, Sunao Katabuchi had already worked on many anime. Black Lagoon was in the future, but he’d served on shows like Arjuna and even Tenjho Tenge (not a fixture on feminist anime lists!) He’d also worked on many children’s shows, including the girl-centred Pollyanna and Tico of the Seven Seas, both part of the World Masterpiece Theatre strand. Katabuchi had also been Assistant Director (under Hayao Miyazaki) on the hugely successful Kiki’s Delivery Service. In terms of its visuals and leisurely pacing, the Arete film is very reminiscent of the World Masterpiece Theatre shows, a tradition which went back to the 1970s. 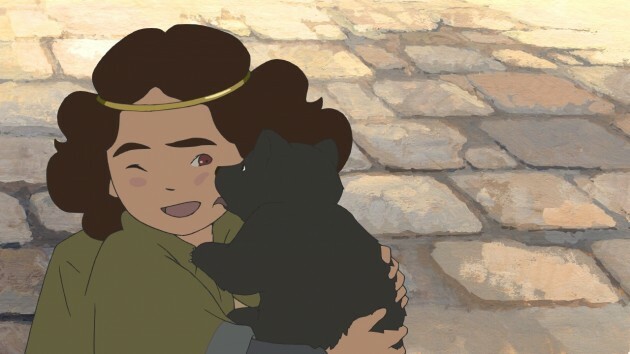 The style still casts a shadow – the recent series Ronja the Robber’s Daughter may be CGI, but it’s still a throwback to the WMT approach. 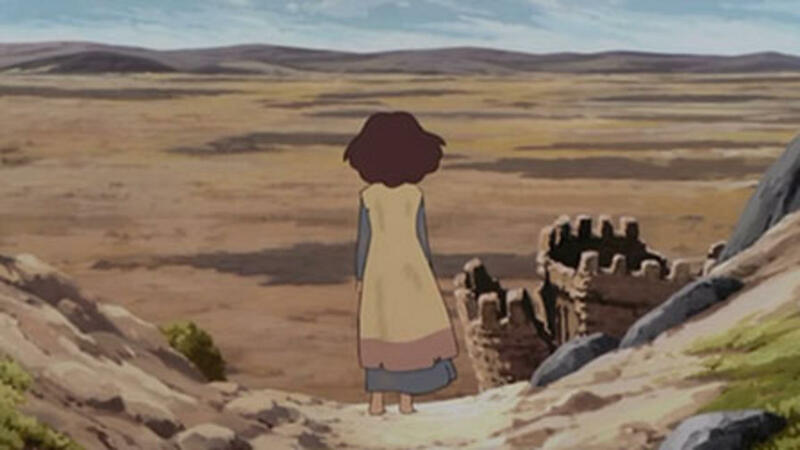 The Arete film has less comedy than the book, more plaintive melancholy about the sadness of the girl’s position, and also a little more peril. In the opening minutes, for example, Arete creeps up a secret passage to her room and must leap over a bottomless pit, though she laughs gaily when she’s across. Like many Japanese adaptations of children’s literature, the anime Arete makes extensive changes to the book. Brief episodes are told at much greater length; a kindly witch becomes a cold character; elements of science fiction are added to the story; and will any anime fan be surprised that there’s now a flying machine? Moreover, although the film’s “villain” is called Boax after the book’s baddie, he’s no longer a buffoon but a pitiful figure. Taniguchi points out the changes to Boax reduce the specifically feminist nature of the book. “The director generalises, or blurs, the feminist theme into the search into the theme of humanity,” Taniguchi writes. “The catch phrase for the animation, ‘A story of a girl who has found the hidden powers of the heart,’ clearly shows its message.” Such a sleight would be controversial today. One might argue Coles’ book was distorted as soon as it arrived in Japan. The Clever Princess parodied Western fairy tales; for example, it uses the rule of three, with Arete given three wishes to help her in three tasks (though the joke in the book is that she completes the tasks without needing the wishes). But while Western fairy tales are certainly known in Japan, they seem less culturally fundamental – after all, as they’re only imports. DreamWorks’ Shrek fairy-tale farces were never big hits in Japan, unlike Pixar’s hugely popular Toy Storys. Japanese creators are blithe about changing foreign stories, even at their deepest level. The Moomins were militarised, for example, while Diana Wynne Jones fans know how much of Ghibli’s Howl’s Moving Castle was unrecognisable from the book, with the film focusing on anti-war sentiments and ad hoc families. To take an adult example, Mahiro Maeda was open about how he “removed the Christianity” from The Count of Monte Cristo when he made his anime of the novel. But as Taniguchi notes, Katabuchi doesn’t take the princess out of The Clever Princess. 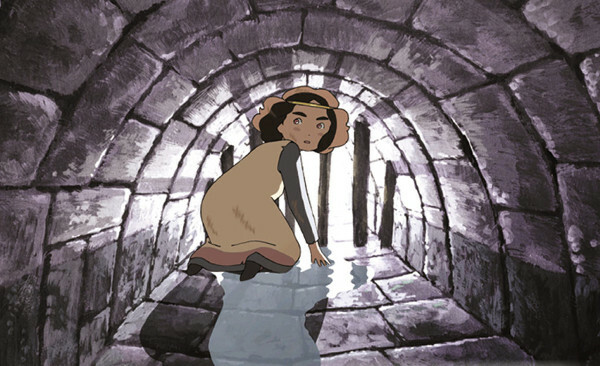 Like the book, “the animation movie lays stress on the story of a wise and clever, self-reliant princess, who does the rescuing of herself and others… (and who) would rather live by her own devices and make her own destiny.” For all the story changes, clever children will see the lesson Arete teaches young princesses in a patriarchal world – beware Prince Charming. Andrew Osmond is the author of 100 Animated Feature Films. 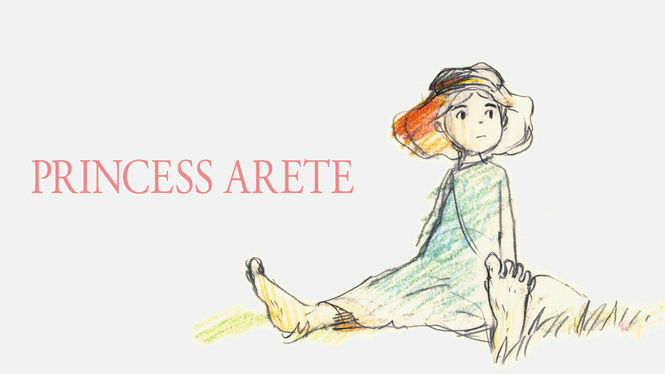 Princess Arete is released in the UK by Anime Limited.